This entry was posted in Autism, Barb Rentenbach, communication and tagged Autism, autistic, communication, non-speaking, non-speaking Autistic, Parenting, Sense, Speech, spoken language, Telepathy, Typing. Bookmark the permalink. Ariane: once again, you have written a thought-provoking column. Particularly, Barb’s comment about talking being like us NTs singing a song in another language….As a musician, I often did this, and some voice teachers encouraged you to just learn it in French (or Italian, or German) by wrote, and don’t worry about what each word means. Yikes! 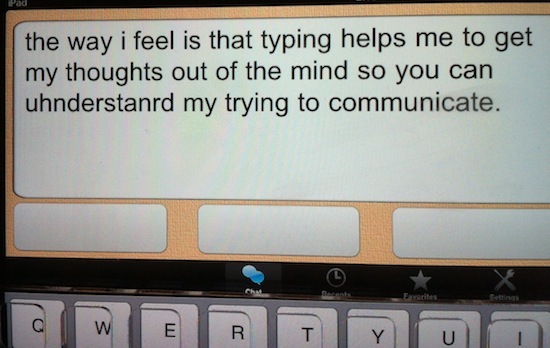 That is a striking analogy for me as to the way an autistic might use spoken language. When I stop to think about the entire music phrase–both language and melody–it takes much longer to “take in” the meaning, and blend it with my own thinking, acting, interpreting, to then come out as “feelings” via musical communication. I will have to think more about this. In grad school I read and fell in love with Elliot Eisner’s writings about diverse modes of communication and understanding. He was writing about the arts and how we in education often neglect those genres, or give passing nods to their importance in the curriculum, usurped by math, science and reading. Yet how many of us could so much better communicate the FULLNESS of our meaning–feeling, connectedness, unconnectedness, empathy, anger, happiness, contemplation, re-interpretation–if we knew and understood multiple means of conveying meaning, and not just language. At any rate, I am running on here…Thank you, again, for making me THINK. Linnea – wow, what a fantastic comment! There is so much here I want to respond to… A year ago or so I was trying to understand some of the things Emma was saying and I asked my friend Ibby to help me. She asked if I spoke another language. I was completely flustered by her question and answered that if it would help me understand what my daughter was saying, I’d learn Russian! She said, no you don’t need to learn Russian, but you need to “feel” her words and language. This was a completely bizarre concept to me. She encouraged me to “lean into” her words and the emotion behind those words. Now, more than a year later, I’m beginning to understand I think what she was trying to explain to me. That the words, each individual word didn’t carry the importance that I was putting on them as much as the emotion behind those words. As an artist and as someone who is married to an artist, we both have placed a huge emphasis on the arts. “Yet how many of us could so much better communicate the FULLNESS of our meaning–feeling, connectedness, unconnectedness, empathy, anger, happiness, contemplation, re-interpretation–if we knew and understood multiple means of conveying meaning, and not just language.” Exactly! I completely agree! I am amazed how well your words speak about my 27 year old daughter. We have for many years thought she is clairvoyant. But perhaps you have described her abilities more accurately. And therein lies the heartbreak because for so long, and even today, those around her do not know how to hear her. She is verbal, but her communication is expressed more in her behavior. And her behavior is not always intended to be negative, but is seen by others as negative. And thus begins the spiraling downwards because of others’ misinterpretations. But music, ah music! She loves the words expressed in songs and can repeat them verbatim, and understands and expresses herself to us through music to relay what she is feeling and thinking – if only we listen. Three simple words a therapist told me a long time ago to say when my daughter is anxious – “I hear you.” We all need to slow down and listen. Thanks for hearing your daughter, Ariane. “her behavior is not always intended to be negative, but is seen by others as negative. ” I get this completely. So completely. Misty – oh how I love, “does not compute, leave a voice message.” I feel that way, though I would have to amend and say leave a written message! Your comment makes a great deal of sense. I also cry easily at movies and songs. How great that he uses art to work through and communicate things he cannot verbalize. And wonderful that you encourage that! I would be completely lost if I was not allowed to do anything other than speak. First – I’m so glad you brought this up. Makes me feel a little less alone in the world, and I think hints at the fact that there are other people who might feel the same way I do. No, I don’t believe it is. Dex and I are both on the high functioning end of the scale, but part of the reason we do well together is we both understand our communication issues. I have problems with context, he has issues with interpretation. BUT, he’s the only other person I’ve ever know who understands when I tell him he ’emits a field of raw emotion’ Everyone does, and I can feel it. It’s a bit like being an Empath in the sci-fi sense of the word. It’s the reason I don’t do well in crowds. Either all the emotions are battering me all at once, or (say at a rock concert or opera), everyone’s ‘field’ is related to or timed with the music. In the first, my instinct is to flee, and in the second, I get ‘stuck’ in a pulsating loop. (I have no idea if that makes sense or not – though it may make sense to Em as I know she loves music at least as much as I do). I think the point is that people emit emotions, and some of us – perhaps us autistic, or neuro-atypical, feel it more than others. If you write a blog post with some of these stories, will you comment back with the link? I would love to read it! Both my husband and I ‘feel’ each other’s emotions. Sometimes we will draw conclusions about the “why” or the specifics of the emotions, but we both are pretty accurate about the emotions being felt by the other. The ‘whys’ surrounding the emotions are what get us into trouble because we so often mistake the other person’s emotions as the result of something we have done, when often it has nothing to do with either of us. I will definitely send you a link! That makes a lot of sense to me. Emma loves doing what she loves and everything else is a big “meh.” Like most people I guess 🙂 However, I do sense that Emma’s desire to communicate is increasing daily. She talks almost non-stop when we go out together. So much more to be learned, but when you consider that consciousness and communication (including phenomena like telepathy) is one of the greatest mysteries in ALL science, and billions of $ are being spent to understand how this “works”, I’m sure much more will be revealed and sooner rather than later. Thanks again to Ariane, my favorite explorer! Don’t you love the way she is coming up to each of us and saying our names? “Daddy? Daddy?” and then will say or ask whatever it is that is on her mind… I love that. And now with her brother… hugging him and going over to him, putting her arm around him. Now, we are onto something . . . I LOVE this discussion. For some time now, I have felt that I am asking my communication partners – those whose hands I support so they can type their thoughts – to, in effect, come down a level or two and use words to tell me what is on their minds. I picture a brain so full of information that it can never find rest and then a surrounding world that fails to “get it!” When two or more of these typers are together I always have the sense that they are able to communicate with one another using no words at all. Luckily for the rest of us, most of them are very patient in dealing with those of us who can’t quite get the knack of “sensing” what another might be thinking. This is just the beginning – great things lie ahead, for sure! I also love this discussion a LOT. I know that as an extreme introvert (not quite on the spectrum tho some have told me perhaps I am) I feel like in crowds I am getting too much information – body language, pheromones, subtle looks that to me seem to carry meaning tho i’m not sure my assessment of the thought behind the look is projection or telepathy…..I know my husband often gets frustrated b/c I’ll answer his question before he has voiced it and he’s like, “let me just say it” and I’m like, “sheesh I got it why do you have to say it.” I have wondered if telepathy is part of Asperger’s – hence the extreme difficulty with bullies and middle school where there really is so much “unsaid” hostility (based on their own uncertainty and fear but it is still extreme). Extraverts just seem (to me) to merrily blunder past all the negative signals. Is it that they don’t hear them or they ignore them or they don’t care? After being in a crowd we introverts have to go recover in silence…even if it’s a room full of silent meditators. What is that about? So thank you for voicing this idea that there may very well be something telepathic underway. Emapths. The next generation? I completely understand about picking up on way too much information and becoming overwhelmed. This happens to me in small groups or at dinner parties, just enough people to feel completely overwhelmed, but not enough to tune totally out. I find my inability to cope with other’s presence is getting increasingly pronounced as I grow older. Some interesting science: http://www.youtube.com/watch?v=Yo0gyXZQv0o Rupert Sheldrake. Thanks for sharing the link, Patricia! I’ve heard that autistics are more “sensitive” than NTs. So wouldn’t it make sense that they would sense more emotion from other people too? Most of our thoughts end up conveyed in our emotions. I think children, especially, “sense” more than adults. As adults we are taught to rely on our minds instead of our gut instincts. Kids don’t do that. Sorry this is sort of all over the place. We had to very unexpectedly put our dog down today. My two kids were at my mom’s house with me, and I was waiting for my husband to pick me up so we could go to the vet and do what needed to be done. I was trying my hardest to hold it together, but both of them could tell something was very wrong. Nathan (my ASD 4 year old) kept looking at me in a very concerned way. He has limited verbal language, but he completely picked up on my emotions. Words were not needed. Beth, I’m so sorry about your dog. I was devastated when I had to put my cat of seventeen years down, it didn’t matter that he was old and lived a long and happy life, I was still devastated… Death is definitely a good example of how inadequate words are to convey our compassion for another and our sadness for the loss we feel. There are so many reasons for difficulty with language. I’m highly verbal and yet still have trouble, because I have a processing issue (or several) spanning listening, speaking, reading, math… I also have trouble sensing some of the usual things about people, but I can sometimes pick up quite well on other things that most people apparently don’t. And then sometimes I function about as well as anybody else in the usual ways, because my issues can be so intermittent. Over the years, I’ve also improved, to a certain extent, in some areas, as well as learned to automatically, reflexively mask or compensate better to make myself appear more functional. I’m trying to make my way through this tangled mess right now, but it’s not easy, and it’s also not easy to explain to others what, exactly, is going on. That means I can be misunderstood all over again, about yet another thing. I’m so glad people are trying to figure all this out now, both by careful observation/consideration *and* by consultation of those of us experiencing these things (which we are also carefully observing in ourselves and contemplating), instead of just making assumptions. The discussions that are resulting will, I’m sure, make things better in the future. Thanks for all the effort and respect. I love reading your comments about what it’s been like, getting a diagnosis, trying to untangle what all of that means and how it applies. I can only imagine, it must be an incredible process on so many levels. Thank you. As tough as it can be sometimes, learning more about myself is a great adventure. I think one can enjoy new discoveries about all sorts of things in life and the world, and exploring one’s own inner world is just part of all that. Please thank you your friend for giving you permission to quote her here! What have I learned? I know how strongly the kids can read my mind, and type word for word if I dictate. I know they often, appear dependent on my vocabulary and knowledge base. I know my bias can bleed through, so I always share authorship and responsibility. I know some of these advanced souls can read my subconscious. I know some can tap into higher dimensions and alternate realities. I know some have inter-dimensional capabilities above and beyond mere telepathy. I have experienced telekinesis. I continue to admit, although improving; I still have difficulty discerning “conscious ego communications” from those that come more from my “subconscious” the “subconscious of the typist” or higher thought forms. I continue to work at that. As the saying goes, you can’t work on a problem, unless you acknowledge it exists. What I don’t understand is why no one seems to want to discus and understand all the variables of the process. The following message was received telepathically by joining consciousness with a friend with autism. She did not type it, but approved its content. It is significant to say that I am somewhat unique in my ability to interpret data. (7-8 percent. Nature is a complex organism of thought forms, reaching for vehicles of expression. I am capable of expression, only when all systems are balanced and synchronized. Achieving balance is like walking a tight rope with both arms extended hoping to keep my balance and to stay on the wire. As my partner, you assist me with the tenuous hold I have on my expressive vehicle. You serve as a balancing pole so to speak. Safety is part of the service you provide me. For I know, in most cases, you will help me rebalance myself before I fall. Even when the fall has not been averted, you provide me with a safety net. I know you won’t let me flounder for long before you bring me to safer ground. Know that to master this linear world is challenging for me. Just wanted to tell you that this line “Does music call to her because it is less about the lyrics and more about the beauty of the music, the feelings the music evokes?” really resonated with me. I don’t like to use the word ’emotions’ when I talk about why I like music, but this is still pretty much how I feel about music. It has always been my main obsession/special interest, and I can name about 3 songs where the lyrics are what I pay the most attention to. So now I’m curious as to what those 3 songs are that you do pay attention to and what about them are interesting when most are not? I feel this way when I look at favorite paintings… I can get lost in them, while other great paintings leave me cold… I cannot explain why, though. A 21 year old former student visited us the other day. He’d just secured a studentship with the Royal Conservatoire of Scotland. This young man is a veritable genius, able to take vigorous autistic talents every-which way. All the deep perspectives I apply to the autistic, pretty much come from conversation with him. He chose drama and then music, in order to access the freedoms of artistic space, rather than give himself over to the meat-grinder experience of striving to intellectually express the truths of the autistic to a resisting socially-grounded audience. Your friends were right speaking is only considered “normal” because the majority of people speak if the majority of people were Autistic the way they communicate would be considered “normal”. Exactly! Read the guest post just published this morning by Dymphna, it’s terrific and talks about exactly this idea that you’ve brought up. 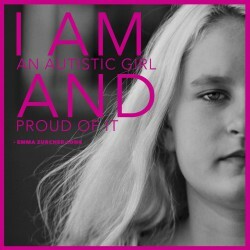 If the majority of people were autistic, I think there would be no one way that was considered “normal”. 🙂 Normal would be doing whatever worked best for each person and their conversational partner of the moment, as negotiated at the time (or there might be a “normal” for particular pairings, in which those communicating were used to each other and already knew what usually worked best, though even that might be different on different occasions for some folks). Using linguistic language implicates far more than the nominal content of communication packets. Rather the systematically organised process of language betokens a vast nexus of collective membership. Using linguistic language involves the user in signing-off on that nexus. Being and developing autistically makes it less than straightforward to so sign-off on that nexus. So signing-off may result in giving up valued aspects of being autistic. Concomitantly, linguistic language is an awkward tool with which to communicate out of autistic being and experiencing. Linguistic language has been forged to serve collective and social functions. There are myriad reasons attaching to preserving the autistic and resisting what is social, that see degrees of linguistic-language silence being functional for autistically developing persons. Autistically developing children who eschew linguistic-language have the sense you speak of. It’s not then that linguistic-language is unreliable and untrustworthy. Rather that linguistic-language in being and doing what it is and does, serves collective societal/social function (something programmatically not affirming and including of the autistic); and does not work smoothly and well across the sensory-cognitive process and experience that autistic being and occurring makes possible. What sensory-cognitive processing an undamaged and protected autistically developing person has, is indeed finely tuned to what is required to be autistic. Our being communicated to by an autistically developing person, say across linguistic-language, is something that this person does to reach out to and accommodate us who are locked into what is mediated by linguistic-language. This as something that this person does in addition to the core imperative of sustaining the integrity possible in being autistic. Does Emma feel your feeling and your thinking. Of course she does. Can Emma tap you into her realtime doing of this; yes. But, in all probability, not across linguistic-language. That tapping in of you to her realtime occurring, requires every language her person embodies and synthesises. The language of her body, her movement, her face, her voice, her hoping, and much, much more. None of this is structural. None of this bounds the autistic. There are no limits to the communication out of the autistic, that this and succeeding generations of autistically developing children will offer up to and for our collective. Where linguistic-language is an instrument deployed in all this, that linguistic-language will be transformed to see it suited to autistic purpose. Only when our social/societal arrangements become affirming and including of the autistic, will linguistic-language become suited to mediating that affirming and including: and that above all is a condition of community; and it a condition not currently obtaining. Autistic children, across autistic sensory-cognitive processing, read the zeitgeist of our collective’s societal-social and its prevailing non-affirming and non-including of the autistic. Some then choose to not much pick up and use the linguistic-language that is integral to all of that. But, and this extraordinary, as they grow they will often choose to partake more of a linguistic-language that serves them so poorly. 1) I don’t claim to be autistic…I do see in myself many traits that would be on the spectrum…and the more I read the more I see this, though on the other hand I see many, many things that don’t fit as well. Label or no label, it’s more about learning about myself and others. It was over 20 years ago that I figured out that we were all at different places on some spectrum – vision, hearing, adhd, etc. 2) When I was in college someone I knew asked me whether I thought in pictures or words. (She was my Bible Study leader and I know I drove her crazy in not reacting to things the way she expected me to.) As I thought about thinking I could see words and images, I wouldn’t call them pictures because they weren’t clear, especially if I tried to see them better. Actually, even the words seemed to elude me sometimes. I couldn’t say that either was the way I thought. I’ve finally realized that my thinking is a combination or words, images, feelings, hints, intuition. I can understand something without being able to describe it. I always hate it when someone asks me what a book is about. I’ve come to realize that I absorb/inhabit it as I read. 3) When I was in a Teaching Lab class I was commended for sitting next to a child who was playing in the sand, playing with my own sand, all without speaking until the child was ready to interact. Now the focus is on exposing young children to as much language as possible, and the teacher is expected to be the example. (Which gives the extroverts and talkers and big advantage in the profession and discourages those of us who are quieter.) I wonder now if some of the behavior problems we see might stem from an overexposure to spoken language. I wonder if that has anything to do with how I freeze in confrontations. I wonder if that’s why I lose track of my side of a discussion when I catch on to the other side. I wonder how much of that I’ve learned to close off or shut down. I feel very similar Barb than you for sharing!